I was watching an episode of "Who Do you Think you Are?" recently, which is a TV show that researches ancestors of actors and other famous people. The gal whose family was being researched learned that her ancestor was high up in The American Protective League. That grabbed my attention because I'd never heard of the organization. I decided to research it and share the info I found with you. 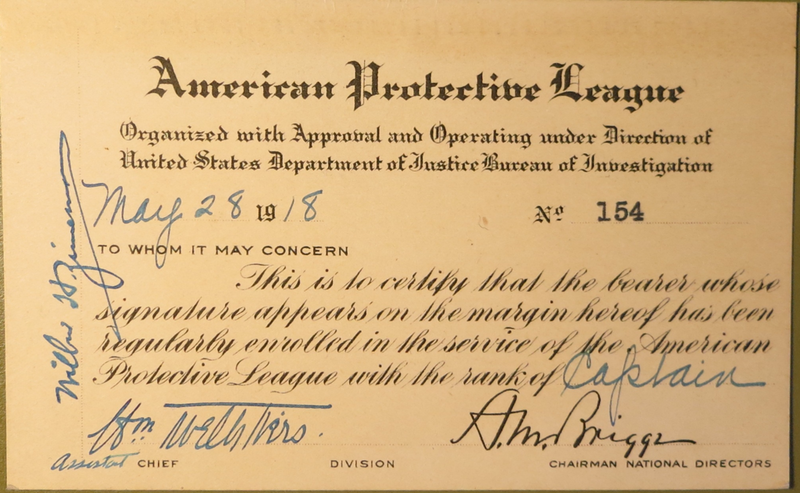 The American Protective League existed only about two years, from 1917-1919. It was an organization of private citizens who worked with Federal law enforcement agencies during the World War 1 era to identify suspected German sympathizers and to counteract the activities of radicals, anarchists, anti-war activists, and left-wing labor and political organizations. 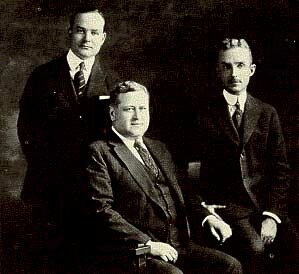 A. M. Briggs, a wealthy Chicago advertising executive, founded the organization in 1917, because he felt the U.S. Department of Justice was severely understaffed in the field of counterintelligence during the new wartime environment. Mr. Briggs proposed the idea of a new volunteer group to agency officials. Participants would not be paid, and they wouldn't benefit from an expense account. 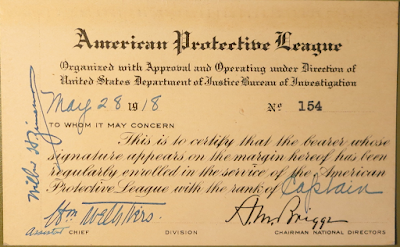 Briggs was given authority to proceed with his plan by the Department of Justice on March 22, 1917, and the American Protective League (APL) was born. Even though the APL was a private organization, the group received formal approval from Attorney General Thomas Gregory to use the words "Organized with the Approval and Operating under the Direction of the United Stated Department of Justice, Bureau of Investigation" on its letterhead. The APL work in conjunction with the Bureau of Investigation (BOI), a precursor of the FBI, to gather information for U.S. District Attorneys. At the time, the BOI only had only 215 agents who had no authority to carry weapons nor the ability to arrest people, so they openly welcomed the APL's assistance. APL members sometimes wore badges suggesting a quasi-official status: "American Protective League–Secret Service." The Attorney General boasted of the manpower they provided: "I have today several hundred thousand private citizens... assisting the heavily overworked Federal authorities in keeping an eye on disloyal individuals and making reports of disloyal utterances." The government had been receiving complaints of disloyalty and enemy activities, and while the Bureau of Investigation was doing its best to contain the situation, the Protective League served as an auxiliary force to put a stop to corruption within the borders of the United States. The national headquarters of the APL was established in Washington, D.C., with A.M. Briggs installed as the Chairman of the governing National Board of Directors. Charles Daniel Frey, of Chicago, served as the national director of the American Protective League, which at its zenith claimed 250,000 members in 600 cities. In addition to its regular geographically-based network, the APL attempted to organize secret units inside factories that produced clothing and war material in hopes of identifying individuals or groups who advanced "disloyalty" or engaged in pro-German activities. Suspects would be reported within the APL organization, which would then make use of its broader network in the community to investigate the activities of these individuals after working hours, if deemed necessary. Teams of APL members conducted numerous raids and surveillance activities aimed at those who failed to register for the draft and at German immigrants who were suspected of having sympathies for Germany. 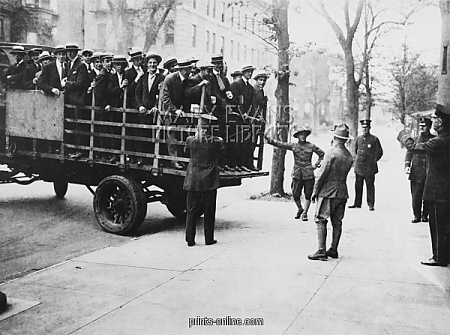 APL members spotted violators of food and gasoline regulations, rounded up draft evaders in New York, disrupted Socialist meetings in Cleveland, broke up strikes, and threatened union men with immediate induction into the army. APL agents, many of them female, worked undercover in factories and attended union meetings in hope of uncovering saboteurs and other enemies of the war effort. Male APL members were often excused from the draft because of their work for the Department of Justice, and higher up officials attained ranks and titles equivalent to the military ranks. APL members were often accused of acting as vigilantes who allegedly violated the civil liberties of American citizens, including so-called "anti-slacker raids" designed to round up men who had not registered for the draft. The APL was also accused of illegally detaining up to 10,000 citizens of German ancestry. President Woodrow Wilson knew of the APL's activities and had misgivings about their methods. He wrote to Attorney General Gregory expressing his concern: "It would be dangerous to have such an organization operating in the United States, and I wonder if there is any way in which we could stop it?" In the end, he deferred to Gregory's judgment and took no action to curtail the APL. 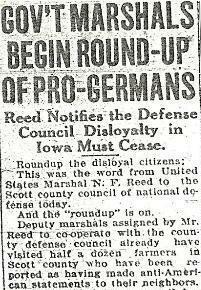 After the Armistice with Germany ended the war, the League was officially disbanded, even though its members insisted they could serve as they had earlier in wartime against America's post-war enemies. The APL survived as a series of local organizations under other names, such as the Patriotic American League (Chicago) and the Loyalty League (Cleveland). 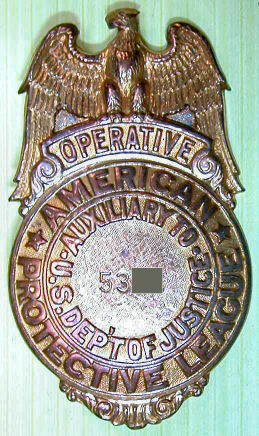 APL members continued to provide information and manpower to the Department of Justice, notably during the Palmer raids of January 1920. Also in the 1920s, the Ku Klux Klan recruited members from the Southern branches of the APL. For years following the war, J. Edgar Hoover's General Intelligence Unit in the Justice Department drew on the APL for information about radicals. It's a matter of opinion whether the American Protective League did more harm than good. Meet the seven Hart brothers of the 7-Heart ranch in central Texas. Each man is content in his independent life, without the responsibilities of a wife and children—until their father decides 1874 will be the year his grown sons finally marry, or they will be cut from his will. How will each man who values his freedom respond to the ultimatum? Can love develop on a timeline, or will it be sacrificed for the sake of an inheritance? 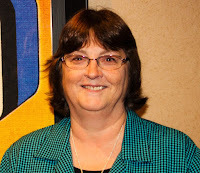 Bestselling author Vickie McDonough grew up wanting to marry a rancher, but instead married a computer geek who is scared of horses. 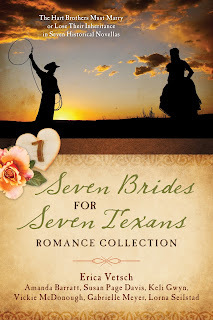 She now lives out her dreams penning romance stories about ranchers, cowboys, lawmen, and others living in the Old West. Vickie is an award-winning author of more than 40 published books and novellas, with over 1.5 million copies sold. Her novels include the fun and feisty Texas Boardinghouse Brides series, and End of the Trail, winner of the OWFI 2013 Best Fiction Novel Award. Whispers on the Prairie was a Romantic Times Recommended Inspirational Book for July 2013. Song of the Prairie won the 2015 Inspirational Readers Choice Award. Gabriel’s Atonement, book 1 in the Land Rush Dreams series placed second in the 2016 Will Rogers Medallion Award. Vickie has recently stepped into independent publishing. Informative and a bit of history I did not know. Thank you for all the research on this post. Interesting how they covered one slacker in red paint. Thanks, Marilyn. America has lots of interesting historical things. Interesting post. American's often forget that we as a nation acted very much like the Nazis, Fascists and Communists in other countries. More often then not citizens were falsely accused. My imagination is mulling over possible story scenarios surrounding this information. Always appreciate these kinds of posts. I agree with you. Americans are blessed, but we sure don't always make wise choices. Vickie, love this post. I did a lot of research about this era for my novel The Crimson Cipher, and yes, there actually WAS a lot of pro-German espionage going on. Factories, railroads, and ships were targeted, among other things. It was a time of great fear. It's scary to think that normal citizens were given such power. Wow!! Very interesting. I find myself wondering about modern times; something like this springing up to identify terrorists. But with all of our issues of civil rights and "freedom of" laws, it wouldn't get very far. And it disturbs me that the Ku Klux Klan perhaps sprung from this activity. I also think of some of the more vigilant work unions around the country, even to this day who will go to great measures to ensure that everyone is on board with the unions' wishes. I could see the "red paint" scenario being pulled off by some of the more extreme members. Great post!!!! Thanks, Connie. It was quite eye-opening to see how much power the individuals in the APL had. Scary, actually. So what is a "100 per center"? Does that mean everyone was at the workplace was required to donate a full day's wage? Or did it mean that everyone donated something at their discretion? This is fascinating! Thank you for posting, Vickie! Natalie, The 100 percent meant that everyone in the company had donated some amount to the Red Cross. 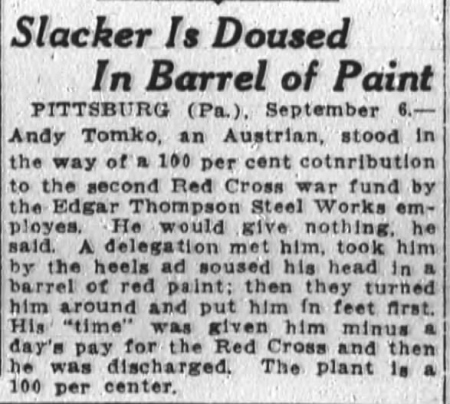 In the "slacker" article, one man refused to donate, thus causing the company to not make the 100% mark. That angered the other employees, who then dunked him in red paint. He was fired and paid, but a donation was taken out of his paycheck so that the company reached the 100% donations mark. Wow, this is scary. APL sounds like it became power happy...glad that it was disbanded. Another piece of history I would not have known without an author's research. Thanks, Vickie. You're welcome! I'm glad this organization wasn't in power for long. I would have been in trouble because I support the Salvation Army over the Red Cross and because my grandparents were German ... although not in as much trouble as others because it was on my mother's side, so my last name wasn't of German origin. I remember elderly neighbors who were German speaking of how difficult it was to be a German American during the World Wars. Had never heard of this organization, Vickie. Fascinating. I have some German ancestry on my dad's side of the family, although my maiden name was Robinson. We also mostly support the Salvation Army. My dad was a member for a time, and even played his trumpet on street corners to advertise their meetings. Here's a fun fact few people know: He went to the SA college/school (not sure what it was called) because his girlfriend went there. After a few months, he decided that it wasn't what he wanted to do and quit. I'm glad he did or he may not have met my mom. Thank you for this excellent article. I am researching a WWI project for the Somerset County (PA) Historical Society and this will provide a useful starting point. Small world, I too saw the program just yesterday 5/4/18 and went on to research and there I found you have done the work for me already. Thank you, good essay.